"The moment you catch feelings, is the moment you catch a bullet." Sony has launched the first official trailer for Edgar Wright's new movie - titled Baby Driver. This is premiering at the SXSW Film Festival this weekend, which is why the trailer is being launched today to go along with all the crazy good buzz this movie is going to have coming out of its premiere. Ansel Elgort stars as a getaway driver named Baby who drives to music, and the movie is said to be set entirely to music with an energetic soundtrack. He gets coerced into working on a heist doomed to fail. The full cast includes Kevin Spacey, Lily James, Jon Bernthal, Eiza González, with Jon Hamm and Jamie Foxx. From the footage in this trailer, I'm totally hyped for this movie, it's going to be awesome especially with all the music. Seriously wow. Turn it up to 11! A talented, young getaway driver (Ansel Elgort) relies on the beat of his personal soundtrack to be the best in the game. But after being coerced into working for a crime boss (Kevin Spacey), he must face the music when a doomed heist threatens his life, love and freedom. 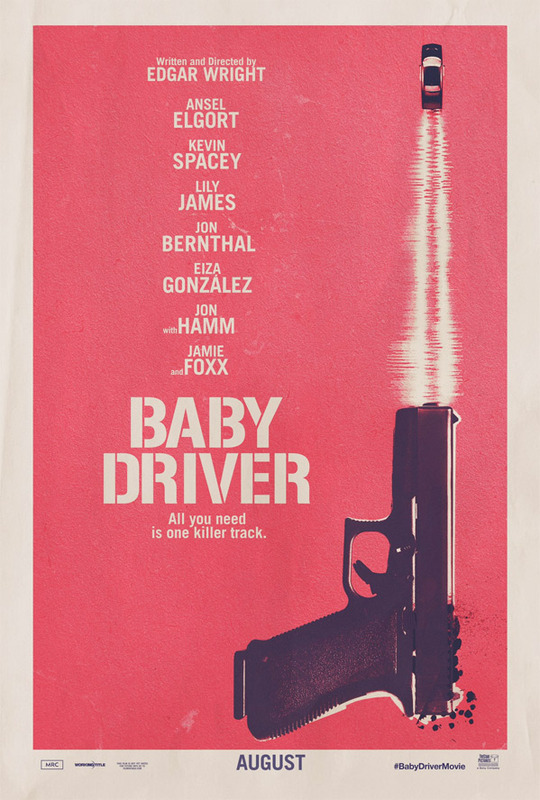 Baby Driver is both written and directed by British filmmaker/wizard extraordinaire Edgar Wright (follow him @edgarwright), of the films A Fistful of Fingers, Shaun of the Dead, Hot Fuzz, Scott Pilgrim vs. the World, and The World's End previously. The film is premiering at the SXSW Film Festival this month. Sony Pictures will then release Wright's Baby Driver in theaters everywhere starting June 28th, 2017 this summer. What do you make of this trailer?